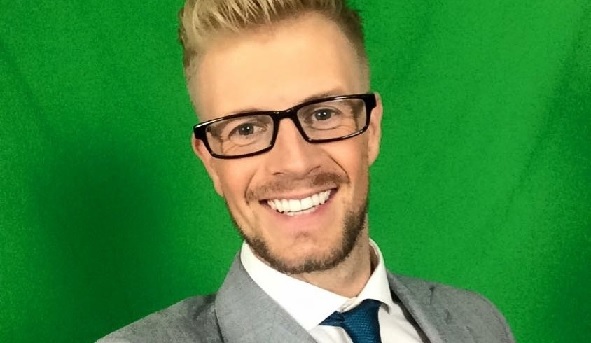 Paul Davies is a 32 year-old journalist who recently won the title of Mr Gay Wales. Davies did an interview with Attitude Magazine where he shared his struggles as a gay person with a physical handicap. He's described as "...fiery and an advocate for social justice," and "disarmingly honest about his disability, even proudly owning the nickname ‘Stumpy’." Attitude: Now that you’re the first man with a physical disability to win a Mr. Gay competition, will you be using your position to address these issues? Paul Davies: I will make a difference, without a doubt. That is literally my whole thing. I believe that I can make a difference. I don’t want to become too preachy but I just want people to understand that within the LGBT community we’re slowly fracturing, we’re all fighting against each other. There’s so many minority groups there that need to all club together. I see people being oppressed within our own community who are disabled or racially different, and we’re fracturing our own communities. We’re making ourselves even more of a minority group because we’re breaking up even more. And like, ‘Whoa hang on guys, this is wrong’, we need to be working together, we need to be inclusive, otherwise we’re no better – we’re losing the fight that we’re fighting. I want to give some inspiration to people with visible disabilities and say, ‘Look, you can do it. You can do this, you can make a difference. Don’t hide away, don’t put your hand in your pocket because you feel somebody’s gonna judge you – show it. Be proud of who you are’. That’s the same thing with sexuality, that’s what it’s all about. For me, I’m a man who happens to like men and I also have one hand [laughs]. I’m blonde and Welsh. There you go, there’s loads of minorities there. It’s about saying hold on guys, we’re fighting for these rights, especially in Britain where we’re very liberal, we’ve got so much now but in a way we’re fighting against each other. Why don’t we all stick together? I want to open people’s eyes a lot more and stop stereotyping and challenge things but at the same time make people come together, to get more united again.